If you want to keep your skis or snowboard performing like they’re designed to, it’s important to tune them regularly. Having sharp edges, a flat base, and a good wax job can make all the difference between an epic and terrible day. You may choose to do some or all of your tuning at home, or you may want to bring your gear to a professional ski shop like evo Seattle, evo Portland, or evo Denver where they have skilled technicians and machines that can do a perfect job. Depending on how often you go to the mountain, you may only need to get your skis or snowboard tuned once per year; if you ride a lot you may need work done weekly. Whether you go to a professional or do it yourself, there is always some tuning you can easily perform at home with the right tools. 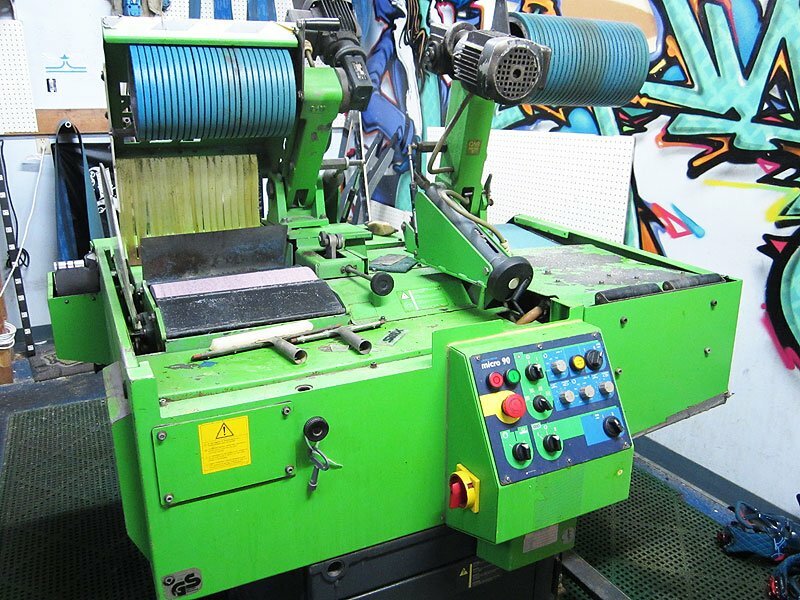 Skis and snowboards normally come from the factory with a finished tune that includes a flat base and smooth, sharp edges. Some manufacturers are better at this than others, so it’s wise to take a careful look at new skis or boards before using them. When do I need to sharpen my edges? The perfect edge is a sharp, clean and smooth edge. New edges usually come close to this ideal, but they can be damaged and dulled by routine use, rocks, park riding, oxidation and road chemicals. If your edges are visibly damaged or rusted, have burrs from hitting rocks or park features, or won’t hold on hard snow, it’s probably time to take care of them. One way to maintain your edges is to have them tuned periodically by a qualified shop, where they’ll use a combination of machine and hand techniques to make sure your bases are flat and the edges precisely sharpened to the proper specifications. Ski and snowboard edges can also be sharpened and maintained by hand, and the skills can be learned by anyone with moderate coordination and desire to master them. Tools needed to perform this work include a flat file, file guide(s) with appropriate steel or diamond files to accurately maintain base edge and side edge bevel, a gummy stone for smoothing and a file card or wire brush for keeping the files clean. 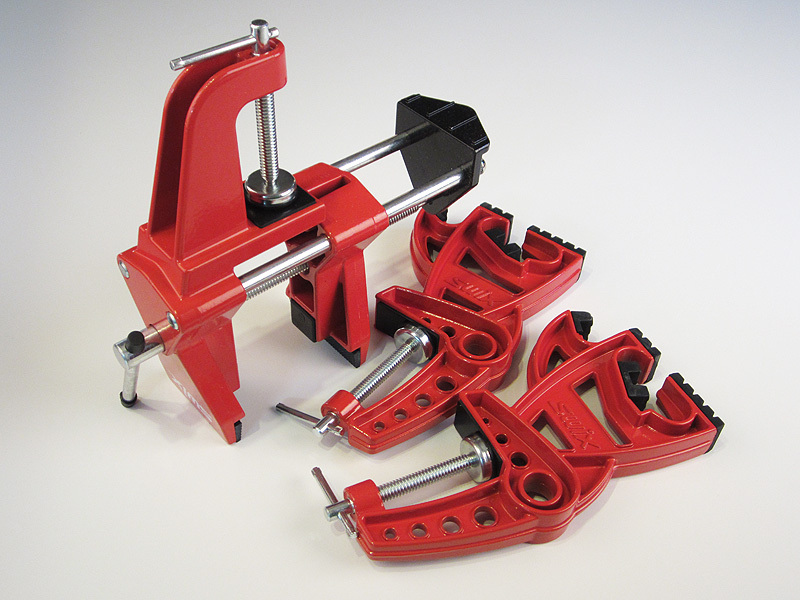 If you decide to work on your edges or bases yourself, it’s highly advisable to get a ski or snowboard specific vise to hold your gear securely. Make sure you get a vise that will accommodate the width of your skis – many older models won’t open wide enough to hold today’s fat waisted designs. Snowboard vises normally hold the board upright or at a slight angle (and width hasn’t changed much over the years) so compatibility isn’t a problem. In a pinch you can perform this work on a table with a couple of 4x4s under the ends of your skis or board (make sure you have a wall to keep them from sliding) or propped up diagonally against a table or counter, but it makes the work more difficult. Retract the ski brakes before you start and use a thick rubber band stretched between the brake arms and over the heel piece to keep them out of the way. 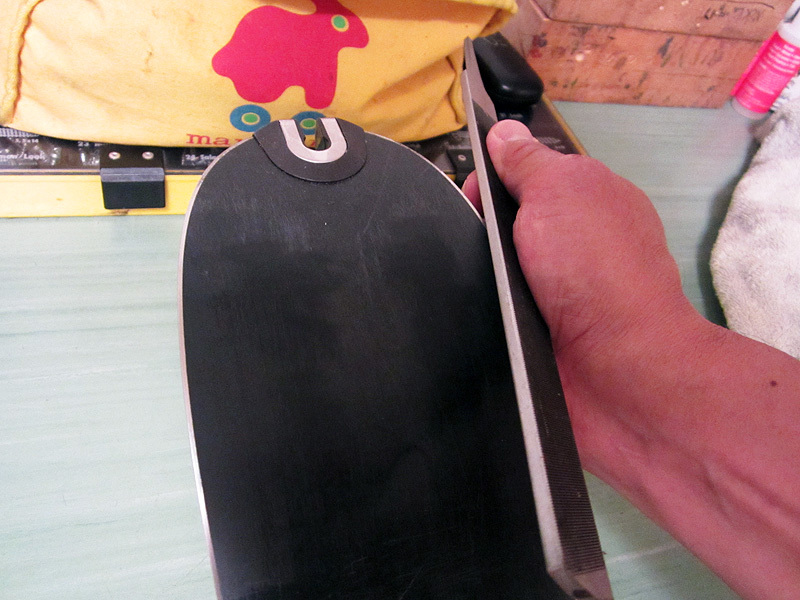 Snowboards can usually be tuned by simply folding the highback forward. If you have burrs in your edges from hitting rocks or other objects, you may have trouble removing them with a regular file. Edges damaged by impact are harder than normal; a coarse or medium diamond stone is usually the best bet for smoothing these out. A diamond stone is also small and light enough to carry in your pocket or pack while you’re on the hill. When maintaining your edges yourself, you’ll need a file guide to preserve the bevel of your edges. Ski and snowboard edges normally have a 90˚ profile when they come from the factory, but they aren’t perfectly square to the base of the ski. Instead, they are beveled slightly away from the snow, usually between .5˚ and 1˚, to make the edge more forgiving and less likely to “hook.” The side edge is usually beveled correspondingly at around 89˚. File guides (both adjustable and fixed angle) are available for both base and side edges to ensure that your file stays at this angle as it cuts. Base and side edge bevels vary according to ski type and intended usage, with racers often preferring a nearly flat base bevel and 2 or 3 degrees of side edge bevel, and park riders often choosing up to a 3 degree base edge bevel with 2 or 3 degrees side. Freeriders and all mountain skiers usually like something in between, typically 1 and 1. If you're unsure what's best for you, it's probably safest to go with the factory bevels for your ski or board and try to maintain them. Side edge bevel guides are normally cast and precision machined to the desired angle, and the file is attached by means of a spring clip or screws. Base edge bevel guides are more elaborate devices that hold a longer file at the desired angle off the base surface. Both types of guide can be adjustable. A low cost alternative to using a base edge guide is to wrap one end of the file with fiberglass strapping tape - three wraps is the approximate equivalent of a 1° base bevel with a 100 mm waisted ski. Many experienced tuners use coarse steel files only for shaping the edge profile, and maintain the sharpness of their edges with a series of diamond files, starting with coarser and moving on to finer. Diamond files (or stones) are blocks of plastic with industrial diamond cutting surfaces attached – they are available in various grades of coarseness. Diamond files are not cheap, and should be used with a water/rubbing alcohol mixture for lubrication to ensure their longevity. 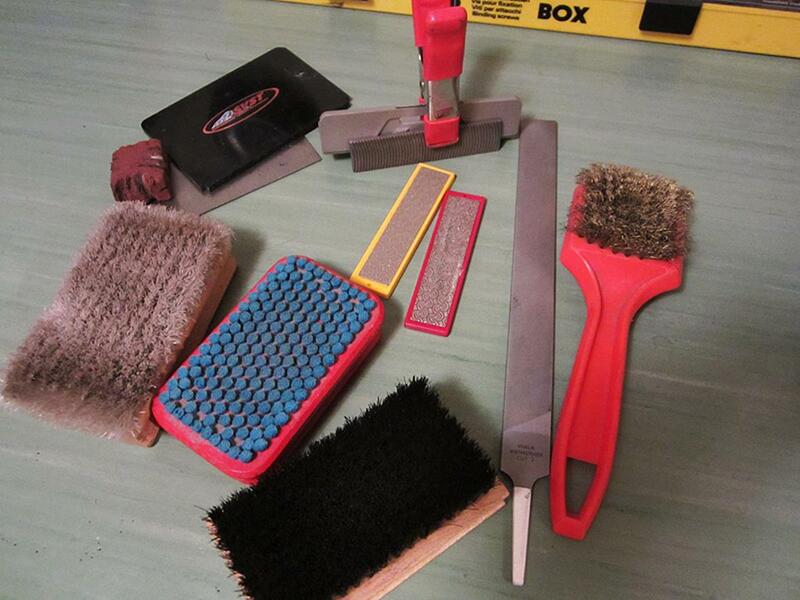 If your bases and edges are generally in good shape, a medium diamond file (200 or 400 grit) and file guide will allow you to maintain your skis or snowboard over the course of the season with an annual visit to your shop for a stone grind. If you choose to use a steel file for edge maintenance, file tip to tail and be sure to apply light pressure only in the correct direction – files are directional and only cut one way. As with diamond files, it’s best to use a file guide to maintain your preferred edge bevels. After filing, edges are normally smoothed and de-burred by making several passes over them with a gummy stone. Gummy stones come in varying degrees of hardness and remove small burrs without taking off too much of the sharpened edge. How do I know if I need to grind or re-structure my base? If your skis or board have bases that are not flat – that is, there are high spots or significant concavities in the running surface – they won’t perform like they’re designed to. The high spots (or the areas around the low spots) have to be ground down either manually or by machine so that the running surface is flat. Since this is difficult and time consuming to do accurately by hand, we suggest taking your skis or board to a qualified shop if you suspect you need this sort of work done. Service technicians will check the flatness of your bases with a true bar and make your bases flat with a stone grinder. The Wintersteiger stone grinder - don't try this at home! Base structure is also important. If you look carefully at a quality ski or snowboard base, you’ll notice that it’s not smooth but actually has a pattern of grooves and/or tiny dimples in it. This “structure” helps break the suction between your base and the snow and lets you slide faster. The base will also absorb wax better with the proper structure. Competitive snowsport athletes often experiment with different base structures for different conditions, but most recreational skiers and snowboarders should be fine with what comes from the factory. Some manufacturers do a fantastic job with the base structures on their final products, others not so much. In the event of damage to your base structure from sustained use, rocks, or heavy scraping, it’s possible to restructure it yourself, but you’ll need the right tools and some expertise. Again, a proper stone grind done by a skilled technician with the right machinery is probably the best way for most people to re-structure their bases. Detuning is dulling or rounding of the edges in selected areas of the tip and tail using a file or stone so that the ski or snowboard is less grabby and doesn’t turn in or initiate too quickly. It’s often done when the board or skis first come from the factory. How far do you detune? Obviously the upturned part of the tip and tail that never contacts the snow can be dulled without affecting performance. From the tip, how far you detune behind the contact point is a matter of personal preference, and you should ride the skis or board first before making a decision. If they feel “hooky” you can begin by dulling an inch or so past the contact point and trying them out again. Take it gradually – you can always detune more, but it’s harder to sharpen an already detuned edge. Detuning the sharp tip and tail edges on skis has the added benefit of reducing the chance that they’ll cut you if they release in a fall. Detuning by holding the file at a 45 degree angle to the edge. When your bases are flat and structured, and your edges sharp, smooth and correctly beveled, it’s time for the next step – wax. Learn more with our How to Wax Skis and Snowboards Guide. Want to get your gear back in tip-top shape and sliding like new? Visit one of our stores where our professional ski and snowboard techs can tune, wax, mount or repair your trusty snow sliders. We have one of the largest selections of skis and snowboards on the web, a super knowledgable staff and expert guides to help you make an informed decision.